Sometimes, in the late afternoon, when the day has been dark under a heavy cloud blanket, the cloud clears cleanly from the west, and the warm-toned evening sun shines in almost horizontally to illuminate the world like a searchlight. Where it shines the light is only sunlight, for the cloud blanket prevents any sky light, so everything is lit in bright high contrast, against an almost-black sky. This is lighting so startling that one needs to be deeply identified to miss it. Any photographer regrets meeting this light without a camera, but I was fortunate on that day years ago when passing the white gate of that farm near Harefield, on the western outskirts of London. So often it is the quality of light that makes a photograph special. sometimes the light illuminating the subject, but more often the light shining through it. Light in the physical world, visual light, seems to call us to mind of a more subtle light. Expression such as "I saw the light", and "enlightened" make a clear connection between the experience of light and the experience of understanding, so a psychological significance to light is admissible even in these secular days, recognisable as an archetypal quality of the nature of mind. In the past however, in less secular times, light was viewed as a symbol of the divine, and this in the most ancient of records. The divine light was seen as illuminating the individual, and then lifting the individual soul itself to radiance, the light shining on it and through it. Light is the messenger of the Universe, telling us almost all we know of galaxies millions of light years away, a little perhaps, like the angels of traditional mythology. Angels are becoming fashionable again, after a long period of neglect. Most of us experience occasional clear moments of creativity or comprehension which seem to arrive out of the blue. We know that the solution has arrived through the vehicle of our own mind, but the process is so deeply hidden that it seems like a gift, inspiration, mysteriously delivered from "above", enabling us to create, or to act, for ourselves. There is today again a half-willingness to personalise this delivery, and to put it into the hands of an angel. Such an angel need have no hope of an external existence, for it is an aspect of mind, the bringer into everyday linear consciousness of the huge parallel processing resources of the brain, a metaphor for brain activity beyond our understanding. In all of this there is only the slightest shift of effect from the action of the angels found in the mythology of most cultures. The angel is a useful metaphor for the action of inspiration or understanding, and need not be a surprising construct, since the mind seems made to use images for internal and external communication. The angel brings us the light that enables us to shine, psychologically and spiritually. During the Middle Ages, when the cathedrals were being built, light symbolism, light metaphysics, was an influential idea. Abbot Suger, whose inspiration can be said to have invoked the change from Romanesque to Gothic architecture, specifically recorded his own peak experiences evoked by light, and set down him aim to use light in his church to lift people from their everyday concerns to a spiritual consciousness. This idea was enthusiastically adopted at Chartres, where almost all of the stained glass remains, making a dark and mysterious interior enveloped in radiant, coloured light. 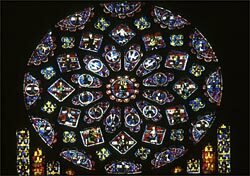 The most enduring impression of Chartres Cathedral lies in the quality of its light, the three rose windows of its nave and choir crowned by the arc of light in the choir clerestory. Here, the truth that the light is shining through the glass, rather than from it, is obvious. Light arouses excitement at simple levels, a floodlit building, an illuminated fountain, a firework display, or the great illuminated signs of places like New York or Piccadilly Circus in London, but also in more subtle ways in the shine of jewels, or the beams of stained glass in the cathedrals. All of these wake us up into sharpened perception. Light calls us to a more alert consciousness, and becomes itself a metaphor for consciousness. We see the sign of consciousness in the face of the green man in traditional sculpture (and now again in modern sculpture), and now we see the sign of consciousness also in light itself, perhaps the first physical phenomenon after energy. First energy, then light, then consciousness. Light by chance will awaken us, but we need to make it less accidental, and learn to wake up for ourselves.